Based on the book by Nick Hornby, A Long Way Down is about four suicidal people who coincidentally pick the same place on the same night to commit suicide. Once they happen upon each other, they seem content to talk each other out of it. They inadvertently become a support group, and decide to promise each other to wait six weeks and see how they're all feeling after that. In the meantime we get scenes explaining the backstory, each narrated by one of the four main characters, as to why they had decided to jump in the first place. Martin (Pierce Brosnan) struggles with overwhelming humiliation after a very public imprisonment that ripped him from his job as a TV host. He had unknowingly slept with an underage girl. Maureen (Toni Collette) is a lonely single mother who feels helpless while trying to take care of her severely handicapped son. She worries so much about him that for her, to be away from him is like missing a limb. Although strangely, she consents to leave him rather suddenly to take a trip with these strangers. Jess (Imogen Poots) is the hard partying daughter of a well known politician. She's depressed and obsesses over the disappearance of her sister. She fights her depression with drugs. The problem is that this thread of the storyline gets forgotten by about the halfway point, and we never hear another word about her missing sister. JJ (Aaron Paul) is a former band member, who relocated to London. He can't seem to keep his band going so he works at a pizza place to pay the bills. He lies to the others about having cancer to hide his real reason. His real reasoning isn't explained till toward the end, but even after learning it he's still the least interesting character here. They all become semi famous due to an article written about them in the paper. They make up a lie about how an angel appeared to them and talked them down off the roof. However, this whole element of their fame and their fake story only matters for one scene before being forgotten. More and more of these inconsistencies stack up. It frequently brings things up only to forget about them a scene later, and while some moments hit their mark, most miss, feeling very contrived. It's obvious when they want a reaction from the audience, but the characters all lack depth and no one character is given quite enough time to be properly fleshed out. Meaning these scenes we are supposed to be moved by tend to fall flat. It's a shame because the acting is actually good, and the talented main cast does elevate the flat writing to a degree, but not enough to make you care that much about them or their budding relationships. One might assume that a story about a group of suicidal friends might be dark, but this films tries to be too fun loving, without taking the darker side of their subject matter seriously. There is never a sense of danger about whether anything bad will actually happen. At some point it's hard to believe that any of these characters ever gave serious thought to suicide. 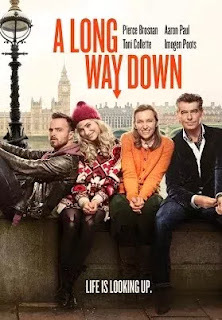 “'A Long Way Down' is a textbook case of over-direction. Characters laugh too hard; the score by Dario Marianelli alternates between wispy guitar strumming and heartstring-pulling piano tinkling; the suicidal characters literally dance to “I Will Survive” at one point. You get the idea. Honest emotion falls victim to poor filmmaking again." It's all trying way too hard to pack too much into too little. This film registers fairly high on the cheese scale. It's just not as deep or heartfelt as it wishes it were. Most of the time you say a book is better than the film version, but even without having read the book I think I can say the book would be better (although I hear the characters in the book are also a bit flat, but at least they're more fleshed out). If you've read the book and want to see it, you might get something out of it, otherwise, if the story seems at all intriguing, I'd recommend the book.